When a band has it, they just have it. Bad Seed Rising is one of those bands and their debut full-length- Awake In Color is one of the most beautiful and heavy records to release this year- not just for debuts. They aren’t new to the game at all. Though young, they’ve released numerous EP’s and have spent time on some major tours- most notably this year’s Vans Warped Tour. They’ve been garnering some major buzz for about a year now, so when they announced the release of Awake In Color, fans immediately started to get restless. But with as much buzz as there has been for the record, a lot of bands would fall short of the expectations. Not Bad Seed Rising- they’ve actually found a way to shatter the expectations. From the opening riffs of “What Have We Done?,” you know you’re in for a hell of a ride and you know it’s gonna be a fun one too. The band moves on to “Dexies” and they’re off and running, not losing a step and showing no signs of slowing down. When we get into the bread and butter of the record- “I Can Feel You” through “Fighting Gravity,” the band starts to really shine and show us what they’re made of. Their versatility is remarkable and impressive. Frontwoman Francheska Pastor’s voice is insane. She can soothe you to sleep and scare the holy hell out of you- in the same song. Her vocal range is up there with the best singers in metal and the rest of the band- Mason Gainer (guitar), Aiden Marceron (drums) and Louey Peraza (drums) are a well oiled machine and are one of the strongest units to debut in awhile. The band can go from straight metal to metalcore to synth metal to pop metal in the blink of an eye and make you love every minute of it. There are no boundaries on what Bad Seed Rising can do and that’s the way it should be. Lyrically, the band makes their mark fast and powerfully. Awake In Color will make you feel good, give you an opportunity to get your aggression out, smile, cry and take you on a rollercoaster of emotions in just 10 songs. When fans started talking about what they wanted from Bad Seed Rising’s debut full-length, this is exactly what they meant. Hats off to the band for writing a record they can be proud of and one that will transcend time. 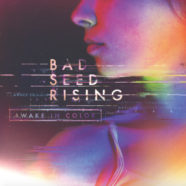 By the end of 2016, Awake In Color will undoubtedly make almost everyone’s top records list and, at the end of the day, this is a record that Bad Seed Rising can be proud to say defines not only them- but those listening to it as well.